Harajiku’s Takeshita Dori is the nexus of Shibuya’s sprawling Teenager Land. Walking the street as a middle-aged guy, you feel like an ancient, moss-covered boulder in a river of selfie-taking youth. This is where high school kids gather, preen, flirt, go on dates, shop and eat cheap foods. Tokyo being Tokyo, there is a corollary of Takeshita Dori, Sugamo — Old People Land. Yes, Sugamo is basically a real-life theme park for Tokyo’s elder population. Famed for their healing powers, two large temples take position along the main shotengai. There, tiny, hunched elder women — crippled by osteoporosis, waft handfuls of fragrant incense smoke onto their backs as randy older gents, natty in fedoras and caps, unashamedly direct the same smoke to their crotches. The street is filled with vendors selling a plethora of typical street foods – where teenagers on Takeshita Dori gobble up crepes, corn dogs and instagram-ready snacks, Sugamo goes old-school with daifuku (balls of mochi stuffed with salty red bean paste), okonomiyaki, yaki soba, takuyaki, steamed potatoes, and steaming vats of amazaki. Some of these vendors have been there for years, their popularity attested to by long and orderly lines. Fortune tellers, dubious monks with “healing powers” and various herbal (and animal) doctors weave long spiels as to the miracles they perform. “Soupon” (turtle) shops, illustrated by vivid posters of the muscle-bound amphibian, do brisk business as they are believed to offer benefits as a blood tonic and stamina builder. Mysteriously, there are numerous places selling only red underwear for good luck, fortune and happiness. Seaweed shops, rice crackers, traditional sweets, old people clothing (lots of cardigans and blankets), produce stores, tea vendors and hat stores proudly cater to their octogenarian clientele. The streets are packed. Granddaughters everywhere, arm-in-arm with ancient relatives, slowly move down the street, coins plucked from tattered purses prompting purchases of fruit, key chains, sweets. The sheer number and variety of elders walking (and rolling) the streets of Sugamo is stunning — rivaled, in my life, only by certain towns in Florida. With all that age surrounding me, I was a smooth stone, skipping along the surface of one of those silt-filled, slow-moving Amazonian rivers. Feeling youthful at 49 is a gift and I guess it got my appetite rearing. 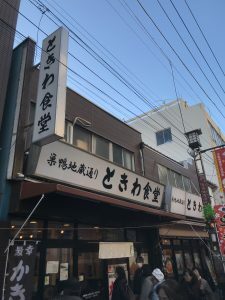 My wife and I spotted Tokiwa Shokudo, packed to the gills, windows dotted with posters of fried mackerel, shrimp and numerous cheap lunch specials. We joined a line studded with bucket hat wearing elders. The bucket hat, an iconic piece of hip hop style in New York, is the hat of choice for older women — they are so ubiquitous, that you almost get a sense, that they are handed out by the government at age 70. Even the red, fuzzy Kangol variety. Tokiwa is a diner. It offers a wide-ranging menu of Japanese soul food and home-cooking specialties. There is a sign on the wall announcing the restaurant’s 7 point manifesto: Everything is made fresh ( from the miso soup to pickles) every day of the week; all the fish, produce and meat is bought direct from farmers or from trusted market vendors; and all the sauces are made on site — nothing microwaved, nothing pre-bought. Everything hand-made. I had a moment of concern in regards to the older clients. Back when I was young and living in Montclair, NJ, the Wedgewood cafeteria flourished as a senior citizen dining spot. The food there was prepared in such a manner to help those with dentures and no teeth. 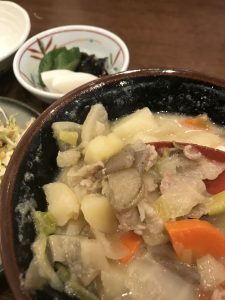 Whatever you were served basically was mush – meat mush, fish mush, vegetable mush. I shouldn’t have been worried. My fried mackerel was perfect, grease-free and crunchy on the outside, moist on the inside. As is typical, the fish is split, splayed open and fried whole (minus the head) which makes the tail act as the perfect handle for dipping into Tokiwa’s homemade Bulldog-like sauce. It was a cold day so I also got tonjiro, a pork, root vegetable and white miso soup that warmed me to my core ( I was lucky, my order was the last before they sold out). My wife had steamed flounder with roe in soy sauce and ginger, and my son, tongkatsu (breaded pork). Surrounding tables devoured lovely looking sashimi, grilled yellowtail collar, fried oysters and a vast variety of miso soup and pickles. It was a cheap and perfect lunch, much better than it needed to be and absolutely deserving of its popularity. I shall return. It has been School vacation time. Kids off for almost two weeks. Sadly, my pockets are pretty light in terms of cash, so, we have not been able to make any big trips. But I am lucky to be so new to Tokyo. There is always something to discover, some train station to pick at random and when it comes together perfectly, you find yourself in Sugamo, re-born, once again, as a spring chicken thankful to not have to eat a turtle to feel young. Yes! Finally something about underwear.